We welcome back Diego von Vacano , a political theory professor from Texas A&M University. With Brazilians protesting the organization of the 2014 World Cup, it would appear that hell has officially frozen over. Few countries in the world are as soccer-obsessed as Brazil. What would cause the sudden surge of mass demonstrations against the building of new state-of-the-art stadiums for the first World Cup to be held in Brazil since 1950? To understand this seismic shift at the nexus of Brazilian politics and culture, we should place it in the historical context of the game in that country. In the 1980s, Socrates was one of Brazil’s best futebol (soccer) players. With flowing hair, long limbs, and often wearing a bandanna and a jersey with the word “democracia” on it, he became a leading figure of the Brazilian national team. His unusual name, and the fact that he was a medical doctor who smoked despite playing at the highest levels, lent him a charisma that made him an iconoclastic icon when he started to support the democracy movement against military dictatorship in Brazil. He also led a players’ democratic structure within his professional team, Corinthians FC, that granted voting power to players on all issues affecting them. This was Brazilian futebol in the 1970s and 1980s: full of creativity, eccentric characters, and politically engaged soccer stars. The zeitgeist was reflected in Brazil’s World Cup teams of 1982 and 1986, which were characterized by artfulness and attacking flair. 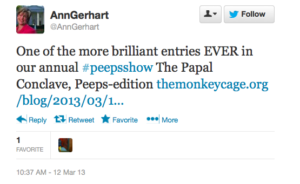 Voting Irregularities in the Washington Post Peeps Contest? 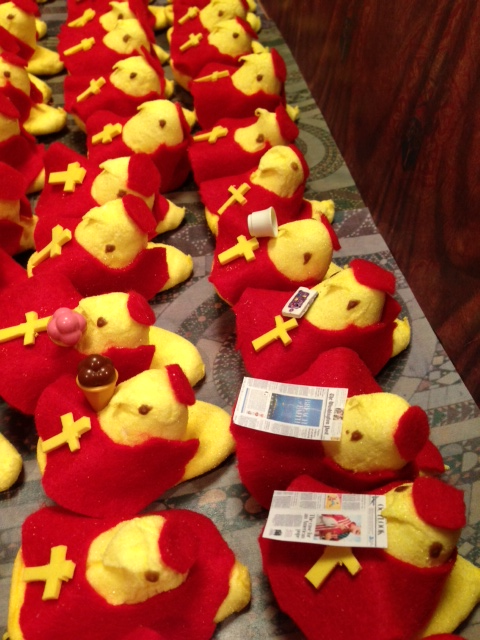 Lined up in my home office are 117 very grumpy Cardinal Peeps. 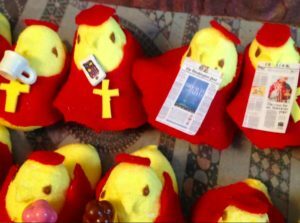 They lost the Washington Post Peeps Contest. 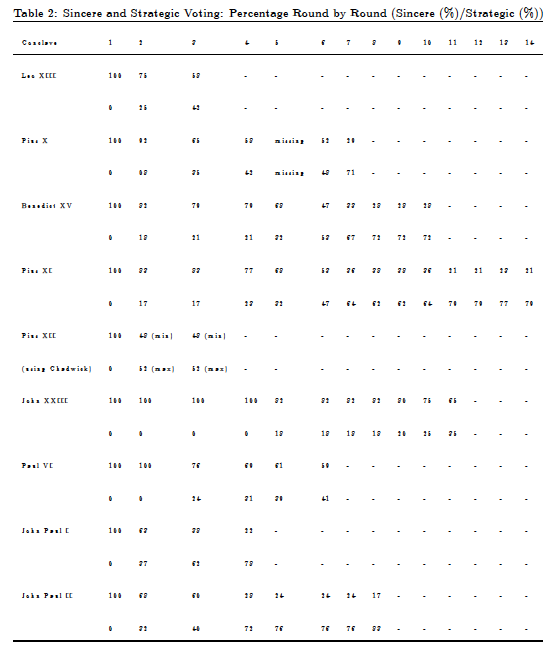 They did not even make the top 42 set of finalists and semi-finalists selected by the newsroom of the Washington Post. 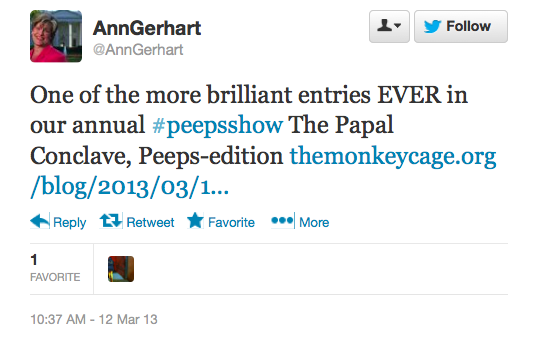 Is an investigation of voting irregularities in the Washington Post Peeps Contest in order? But alas, the mainstream media is unmoved by social media: the conclave did not pass muster with the Washington Post newsroom, whose votes selected the contest winners. This travesty of Peepal justice makes me wonder about the voting rules used by the Post to select the contest winners. Is the voting rigged? Does the newsroom keep a paper trail of its votes? Were the Post’s voter rolls purged of reporters with the best sense of humor before the elections? Does the Post’s Magazine editor turn away newsroom voters after the polls close even though they’re still waiting in line to vote? Did the editor reduce the number of early voting days when the Peepal Conclave started racking up votes? Do we need election observers at the Post for next year’s Peeps Contest? Bring in Bob Bauer and Ben Ginsburg and investigate! (On the bright side, I don’t spend my time posting comments on Captain Sulu’s Facebook page.) Regardless, rest assured that my daughter and I have dusted off the Peeps sugar, moved the Sistine Chapel off the dining room table to make room for a Passover seder, and are already looking forward to next year’s contest. In modern times, the College of Cardinals have been locked in the Sistine Chapel with the purported aim to divine the Will of God in the election of the Pope. Between 20 and 60 percent of cardinals vote for the same candidate throughout the conclave, depending on the length of the conclave. For those cardinals that change their voting behavior, they are influenced by both the vote counts and the nightly conversations. However, in unifying the cardinals to one winner the dominant force is the observed vote counts. Finally, as is seen by the uneven voting activity among the cardinals, there is unobservable heterogeneity among the cardinals that is constant across time. Only a select subset are considered serious contenders for the position of the Papacy. One interpretation is that this is the Word of God. The voters do not perceive the cardinals as equal candidates. More cynically, one might argue that the differences observed are the result of the pre-conclave maneuverings. However, why would the effects of these be constant over time? We could expect these effect to die off after the observations of the first vote count. However, as God is omnipresent and all-knowing, having His effect to be constant over time is less of a surprise. Either way, this unobservable heterogeneity is accounted for in the estimation process through the inclusion of fixed effects parameters. 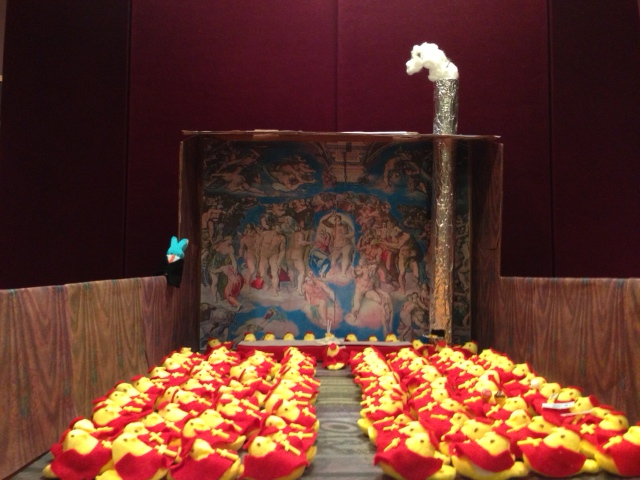 We outfitted 117* chick Peeps in red felt cardinal suits and cooped them up in a home-made replica of the Sistine Chapel. (H/t Michelangelo.) The blue guy keeping tabs on the proceedings? The Pope’s Peeping Butler is back on the job. 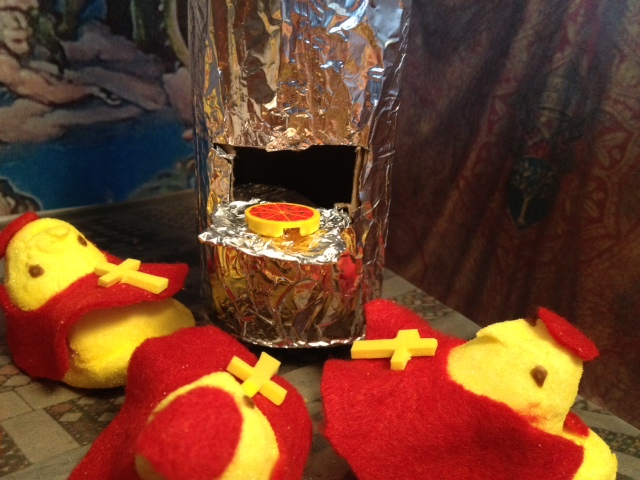 *The diorama includes two extra birds Cardinals since the Washington Post Peeps Contest entry deadline fell before two papabili dropped out of the Conclave. Birds of a feather don’t always flock together. Nearly three dozen downtown bars, restaurants and beer shops have agreed to halt alcohol sales to counter an early St. Patrick’s Day celebration created by Penn State students, the most aggressive effort yet to curb drinking for the unofficial holiday known as State Patty’s Day. Every downtown establishment that sells alcohol will refrain from doing so Saturday, said Damon Sims, university vice president of student affairs and co-chairman of a committee known as the Partnership: Campus & Community United Against Dangerous Drinking. The majority of the funds to pay for the subsidies to businesses would come from campus parking fees collected during previous State Patty’s Day weekends, he said. Article here. Hat tip to Chris Zorn. Wondering why we’ve just witnessed the first papal resignation in 600 years? The following guest post from political scientists Forrest Maltzman and Melissa Schwartzberg, the co-authors along with the late Lee Sigelman of “Vox Populi, Vox Dei, Vox Sagittae”, points to a potentially surprising observation: just like prime ministers in parliamentary systems of government, the Pope may have realized the value of timing elections strategically. In 1996, Pope John Paul II changed the voting rules that had governed papal succession since 1179. After 33 or 34 rounds of voting, the vote threshold could be reduced from a two-thirds supermajority to a simple-majority vote. The cause of this decision remains mysterious. In joint work with our late colleague Lee Sigelman, however, we speculated that the involvement of Kenneth Arrow in the Pontifical Academy of the Social Sciences may have played a role in designing a rule that would break what we cheekily termed “encyclical majorities,” aimed at reducing the likelihood of deadlock. Though the 1997 addition of Partha Dasgupta to the Pontifical Academy might have been expected to bolster support for conclave majoritarianism, in 2007, Pope Benedict XVI reversed the rule change, returning it to the rule developed by the Third Lateran Council in 1179. A spokesman for Pope Benedict XVI in 2007 identified the reason for the change as the desire to “guarantee the widest possible consensus” for a new pope. Concerns about the threat dissension among fallible electors would pose to the attainment of consensus have long led to changes in voting rules. Canon 1, Licet de Evitanda, of the Third Lateran Council in 1179 cited as a cause for the reduction of the threshold from unanimity to two-thirds the problem of “some enemy sowing tares,” motivated by wickedness or ambition. There has been some speculation that the motivation for Pope Benedict to reduce the threshold was concern that supporters of a candidate with a bare majority in early rounds would have no incentive to compromise or capitulate, leading inevitability to protracted conclaves and exacerbating what Lee termed the “fissiparous politics” of the Church. It is surely possible that this is the case, though it is difficult to see how the challenge of attaining consensus, given the existence of disagreement, is more easily remedied by a rule that enables one-third plus one of the cardinals to veto an election than a rule enabling one-half to veto. It is possible that the higher vote threshold would encourage the cardinal electors to reach agreement rather than holdout, but it is equally likely that deadlock would persist. Once chosen, however – and voting in the conclave is famously secretive – it is true that the achievement of a supermajority vote might signal agreement to an extent that a bare majority would not, though a long conclave would, presumably, affect the strength of that signal. We admit that we do not have a personal relationship with the Pope, his cardinals, or even a papal butler who is willing to share Vatican secrets. Nonetheless, a look at the distribution of recent appointments of cardinals from the perspective of a veto pivot is suggestive – and it is certain that a pope would have greater capacity to influence the choice of his successor under a two-thirds rule than a simple-majority rule, simply by virtue of the smaller number of votes necessary to veto. In February 2012, Pope Benedict named 22 new cardinals, 18 of whom were eligible to vote. At the time, the appointments were considered noteworthy for the extent to which they moved away from the internationalist trend promoted by Pope John Paul II. The February appointments raised the proportion of current or former Vatican officials over the one-third threshold to 35% (44 of 125 electors). To the surprise of many Vatican-watchers, Benedict XVI then named six additional cardinals in a November consistory, doing so ostensibly to show that the “church is a church of all peoples, [and] speaks in all languages.” It had been nearly a century since two consistories for the elevations of cardinals had been held in a single calendar year, and was especially unusual given the large number of anticipated vacancies in 2013. On February 28, there will be 117 cardinal electors, 67 of which were appointed by Benedict XVI. Of the 117, 61 are Europeans, and 38 – almost precisely one-third – are current or former Vatican officials, members of the Roman curia. One former member of the Roman curia, Walter Kasper, will turn 80 on March 5, rendering him ineligible to participate on that date. Is it possible that the timing of Benedict’s departure was affected by concerns about the distribution of votes were he to linger? Again, we do not have sufficient knowledge to make such a claim unequivocally, but it is surely possible that the choice of a successor may have been a factor in his decision-making. And it is possible that either divine insight or strategic thinking may have led the Pope to believe in 2007 that changing the rules was crucial to ensure that the Roman Curia could still call the shots. Though we cannot be certain, let us be clear: we think Dasgupta is off the hook. That’s it. Don’t really have anything more to add at this point, just figured it might be a while before I ever get to write that as a headline again (e.g., maybe 600 years or so…). A book entitled “Selecting the Pope: Uncovering the Mysteries of Papal Elections”is available at Amazon.com at a bargain price! (Wonder how long it will take Amazon to up the price…). Duck of Minerva has a similar post to this one, but with some quotes as well. The college football bowl season gets underway this weekend with an exciting doubleheader. First up is the Gildan New Mexico Bowl (featuring two five loss teams hoping to avoid becoming a six loss team—though apparently being a six loss team is enough to make it into the Little Caesars Bowl on December 26). This is followed by the famous Famous Idaho Potato Bowl, held in the Big East’s new capital city: Boise. President Obama has of course been a proponent of a college football playoff system and in fact PolitiFact checked off a “promise kept” in July when the NCAA adopted a version of this plan, effective after the 2014 season. To my knowledge, though, Obama has never sought to declare his own national champion, no matter how bizarre or biased the BCS system’s calculations. On December 6, Nixon showed up at Razorback Stadium with a “national champions” plaque as the University of Texas took on Arkansas, both teams 9-0 and aiming for the Cotton Bowl. 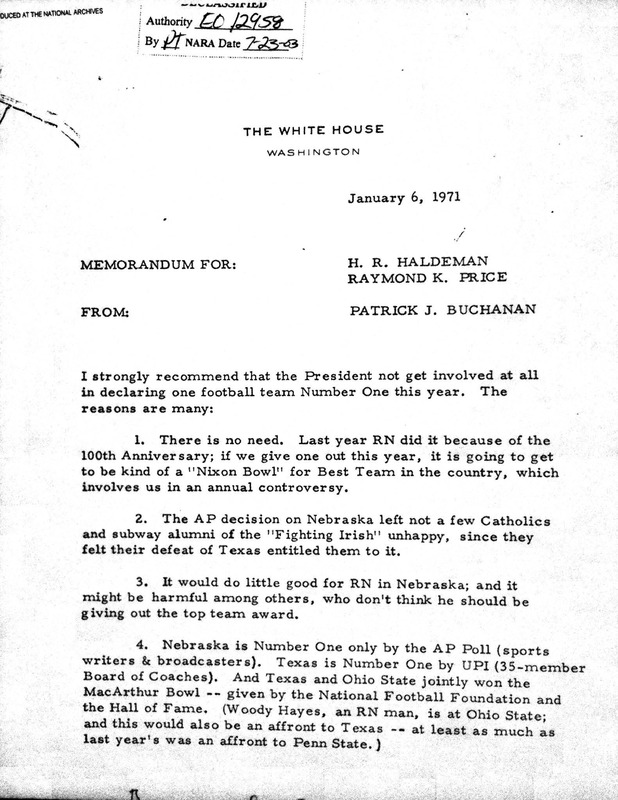 Penn State was 10-0, but apparently Nixon’s “Southern Strategy” took precedence. Texas won, 15-14, after trailing 14-0 after three quarters. 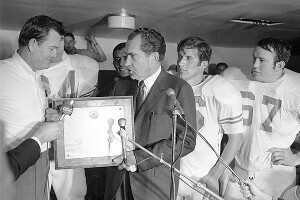 Nixon presented his plaque to UT coach Darrell Royal in the Texas locker room, with ABC broadcasting it all to an estimated 50 million viewers. That taxes, the national debt, or health care reform have been central issues in this presidential campaign is hardly surprising. But the same can’t be said for the slogan “Clear Eyes, Full Hearts, Can’t Lose,” the mantra of fictional football coach Eric Taylor of Friday Night Lights fame. With Governor Romney using the show’s trademark phrase, with an actress from the show likening the Governor to the show’s unethical and overbearing football father Joe McCoy, with the original book’s author endorsing Romney, and with the TV show’s creator asking the Governor to stop using the phrase, it’s time to look a little more deeply into the politics of “Friday Night Lights.” My ultimate goal: to learn the politics of the inscrutable Eric Taylor. But in keeping with a good football show, let me not give away the ending. For those unfamiliar with the show or the backstory, a paragraph won’t cut it, but I’ll try. In 1990, journalist Buzz Bissinger published a non-fiction book about his year with the Permian Panthers, a high school football team from Odessa, Texas which had been a perpetual contender for state championships. Peter Berg then created a five-season TV drama using material from the book along with his own creative license. It aired from 2006 to 2011, and renamed Odessa “Dillon.” And since Bissinger’s non-fiction narrative makes it clear that truth can be stranger than fiction**—I’m thinking about the involvement of Texas’ top education official in deciding on a high school player’s grade, and hence his playoff eligibility—Berg’s show is able to be fully fictional and yet stay reasonably close to real-world events. Although about high school football teams, the show centers as much on Coach Taylor and the guidance counselor and high school principal who is also his wife (Tami) as on the players themselves. There are spoilers below, but I assume the set of people who are still reading this and aren’t familiar with the show is approaching zero anyhow. 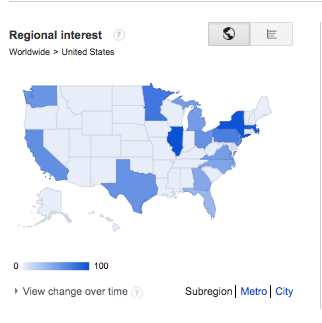 First, let’s start by looking at the geographic distribution of Google searches for “Matt Saracen,” under the assumption that there aren’t too many other reasons to Google that particular name. Saracen is Eric Taylor’s second and most earnest quarterback during the show, a teenager who has been raised primarily by his grandmother and whose father served in Iraq. The Google searches suggest that Friday Night Lights plays well in places like Romney’s home state of Massachusetts, but also in Obama’s home state of Illinois, in New York, in Texas, and in other places with large, college-educated populations (in absolute terms). Buddy Garrity is an affable car dealer and big-time football booster whose wife leaves him for someone he denounces as a tree-hugging leftist. That’s a sizable hint about his politics—when he’s off raising money for a Jumbotron for the football stadium, he’s probably not doubling as an Obama fundraiser. In the model, I call him a business owner, and also identify him as a non-Hispanic white and as a 45-year-old Protestant. I’m guessing his income to be $80,000, but it looks like the car business is very boom and bust, and the one firm financial fact we know is that he sells his house after his wife moves away for a bit over $200,000. The survey didn’t ask about having a passion for football (or for employees), but the model gives him an 84% chance of backing McCain nonetheless. From Buddy Garrity, it’s natural to move on to Joe McCoy, the character that actress Jurnee Smollett likened to Governor Romney. I include a linked picture below so readers can judge for themselves. Joe McCoy flatters Eric Taylor by explaining that he moved to Dillon, Texas so Eric could coach his son J.D.—and then has Eric fired and replaced with his son’s personal coach. Fans of the show will hate to hear this, but from a survey research point of view, Joe McCoy looks a lot like Buddy: both are church-going Protestant fathers separated from their wives, and both are on the upper end of the local income spectrum. Still, for McCoy, the upper end is quite a bit higher—so simply by shifting the “Buddy” model to have an income of $200,000, we get a probability of voting for McCain that is 89%. That’s a nice illustration of Andrew Gelman’s point about the relationship between income and Republican voting in red states. Tim Riggins is one of the most intriguing figures on the show—he has what an earlier generation would have called “character,’’ and lots of it, although that doesn’t keep him at football practice, in college, or out of trouble with the law. Based on his high school education, and a rough guess that his annual income is $20,000—hey, if I knew exactly how lucrative running a chop shop was, you’d worry—I get Tim’s probability of backing McCain at 58%. But let’s not forget research by Vesla Weaver and Amy Lerman showing that encounters with the criminal justice system are demobilizing in general, or Marc Meredith’s evidence that turnout among former felons is low. So it wouldn’t be shocking if Riggins passed on voting in 2008 entirely, even though Texas does restore the voting rights of those who have completed their sentence. Politics is everywhere in the show, but explicit discussions of it are rare. One exception is an awkward “meet the girlfriend” dinner where Landry Clarke’s mother tries to relate to Jess Merriweather by asking about President Obama. Both Jess and Ms. Clarke tacitly agree that he’s doing a good job so far. It’s certainly plausible that Ms. Clarke—a white woman married to a Dillion police officer—approved of Obama during the early days of his Presidency. But according to the model, she nonetheless had a 65% chance of backing his 2008 opponent, John McCain. The same male profile would back McCain at 71%, showing that the gender gap has its limits. It’s a gap in the London Tube sense of the word—something you might not see if you aren’t careful. On the other hand, Ms. Clarke’s interlocutor at dinner was a black high school student and aspiring football coach, Jess. Jess was probably too young to vote in 2008. But let’s say she makes $10,000 a year working at her father’s restaurant—and that she managed to turn 18 in time. In that case, she’d vote for McCain about 4.6% of the time. That number grows to 58% if I hold everything constant save her race. So if you want to talk about gaps, the black-white gap in voting behavior is a place to start. What about Tami Taylor, guidance counselor, principal, and surrogate mother to many? In the fourth season, Tami gets embroiled in local abortion politics, but the issue centers on allegations about her advice rather than her actual views, which are less clear. The Taylors’ financial situation is also a bit confusing—they seem stretched past the limit when Eric writes a $3,000 check to cover new uniforms, but they are a two-earner family in a county where the median home value for owner-occupied housing is $75,500. I peg their household income at $110,000, and don’t need to worry about who earns what. And by calling Tami a “professional,” I estimate her probability of having backed McCain to be 66%, or just about 2 out of 3. That might have changed slightly if I had identified her as a government worker—and more so if she were in a union. On, then, to Eric Taylor. Linguistic George Lakoff would be likely to infer from Taylor’s “tough love” coaching style that he isn’t a fan of coddling, and thus isn’t very liberal. But drawing clear connections between parenting or coaching and politics can be a stretch—and in this case, we’ve also got Taylor’s demographics to fall back on. If we assume he’s got his wife’s demographic profile but for the gender, he’s a McCain supporter 71.7% of the time. And if you think that misses the mark—well, you can certainly lobby the National Election Study to ask questions about whether you would go for a two-point conversion down by a point at the end of the fourth quarter. ** ADDENDUM: This previously read “strains belief.” I meant that the events that Bissinger describes with respect to a Dallas high school—and that were reported elsewhere—are so striking that they sent me immediately to my computer to read more about the incidents and issues. It’s a case where truth is stranger than fiction. I highly recommend the book, and in no way meant to suggest that it was “truthy” or inaccurate.